Post-Holiday Clean Up? 7 Ways to Bring It On! As the New Year begins, it’s an exciting time, packing away the old to make room for the new. 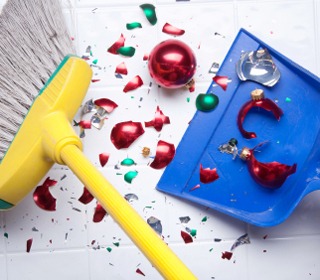 Rather than being overwhelmed with post-holiday clean up, think of it as a new start for you and your home. The Big Clean – The Japanese New Year tradition called Oosouji means, “The Big Clean” and everyone in Japan takes it to heart. During the final week of the year, they spend time cleaning, decluttering and organizing their homes, offices and schools in order to start the new year with a fresh outlook. This approach seems to work far better than rarely kept resolutions, so give it a try. Re-Organize Decorations Before Storing – Start your big clean by re-organizing Christmas decorations before packing them away. Look at everything and eliminate the items you didn’t use. Roll up strings of lights onto wrapping paper tubes to keep them from tangling. Organize decorations in see-through plastic bins and label them according to where they are used. Organize Storage Areas – Now that you’ve packed away decorations, why not organize the storage space in the attic? Building shelves that fit into the rafters is an easy DIY project. A variety of plans are available online and all you need is some lumber, a circular saw, a drill, maybe a hammer and nails, too. Soon those storage bins will be neatly tucked away until next year. Mulch Christmas Trees – Recycle the Christmas tree into mulch rather than contributing to landfill overload. Many cities offer curbside tree pick-up or rent a chipper/ shredder and do it yourself. If the tree left a trail of needles on its way out the door, vacuum them up so they won’t burrow deep down into rugs and carpets. Tape lint rollers are great for picking up stubborn needles off of furniture and rugs. Freshen the Carpet – During the holidays your carpet can take a beating from muddy foot traffic and other unfortunate messes. For wine stains, sprinkle a few drops of white vinegar onto the stain and blot with a damp cloth. If your rugs are really dirty, consider renting a carpet cleaner and freshen them up. The holiday mailing box challenge – fill old mailing boxes with items like clothing, books and toys to donate to charity. See how many you can fill! Sort through holiday cards, make a note of who sent them (for next year’s list) and cut gift tags out of the cards you like. Swap already read books online at sites like Paperback Swap and Book Mooch. The White Elephant Super Bowl exchange party – re-gift those “special” presents while getting your football face on. Get Tax Paperwork in Order – The end of the year is also a great time to organize what you need for filing taxes. Set up a special file to deposit all incoming tax forms. Be sure to add receipts from charitable donations. Sort through and shred papers that are no longer needed. Go paperless whenever possible to help reduce the paper clutter. The holidays are a wonderful time to enjoy our friends and family and to usher in the new year. You’d be surprised how decluttering your surroundings will lighten your mood and lift your spirit – start the New Year with a fresh outlook and an organized house! From circular saws and drills to carpet cleaners and wood chippers, our expert staff is always on hand to help you find the right equipment to handle your home DIY project. Looking for more ideas on how to make a fresh start in your home after the holidays? Check out our previous blog. As always, if you have any questions about what to choose, pricing or how-to’s, don’t hesitate to contact us. Stop by our store — we’re open seven days a week.